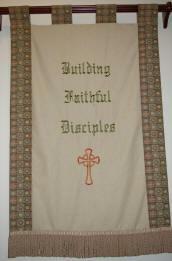 In 1802 the Tennessee Conference was assigned responsibility for the Methodist churches in the Mississippi Territory. The Mississippi Conference was established ten years later, and the Conference met for the first time in 1813 at Spring Hill in Jefferson County. Mississippi became a state on December 10, 1817, and soon thereafter pressure was brought to bear on the United States government to acquire the remaining Choctaw and Chickasaw Indian lands, a major portion of the state’s territory. The signing of the Treaty of Doak’s Stand in 1820 opened what is now central Mississippi for settlement. Settlers began to move to this area, and Madison County was formed in 1828. According to oral tradition, for a number of years before the establishment of the Methodist church in what is now Madison, people of various denominations in the area worshipped at a structure that was located on the Magee plantation. The exact location of the plantation has not been documented, but some accounts place it near the old Natchez Trace east of Madison, while others have stated that it was located several miles west of present-day Madison on Ridley Hill Road. The construction of the New Orleans, Jackson, and Great Northern Railroad in 1856 promoted settlement around Madison Station. Eight years later in 1864 near the end of the Civil War, the Madison Mission was established under the auspices of the Livingston and Pearl River charges by the Annual Conference in its meeting at Crystal Springs. Harvey Copeland, who had come to Mississippi from the Memphis Conference in 1856, was appointed to serve as the first pastor of the mission. Following the Civil War, Copeland, possibly accompanying other Confederate citizens who sought exile in various Latin American nations, went to British Honduras, where he died in 1879. Although no longer an active church, the nineteenth-century Pearl River Church building, seven miles northeast of Madison off Old Canton Road, has been preserved and designated an official Methodist Historic Site under the oversight of the Pearl River Church Historic Council that is composed of members of the Madison United Methodist Church and other interested citizens. The Livingston charge no longer exists. In 1865 the Madison mission reported eight white and twenty black members. The Madison charge was created in 1870 during the year that the state of Mississippi was readmitted to the Union. During the early history of the Madison Methodist church, ministers served and moved to other churches on an annual basis. The first multiple-year pastoral appointment was held 1872-1875 by Warren C. Black, who later served as editor of the New Orleans Advocate. The pastor during 1899-1900 was Henry G. Hawkins, a former missionary to Japan. During his pastorate, the first Lambuth Day observance was held to erect the monument to the Lambuth family on the grounds of the historic Pearl River Church. Following the establishment of the Madison mission, the church building on the Magee plantation was dismantled and moved to the site of our present-day church. The best of the material was salvaged and used to erect the first religious edifice in Madison, which served as a place of worship for approximately sixty-five years. Paul H. Grice, who was appointed as minister in 1929, launched a campaign for a new sanctuary. Following his arrival in Madison, Reverend Grice learned that among the worshippers at the church in its early years was a widowed mother, Susan Montgomery, who had instilled in her eight children her love for the church. Her second child, Arthur, who was born in 1854, settled in Atlanta, where he became affiliated with the Atlanta Coca-Cola Bottling Company. After being contacted by the Reverend Grice, Arthur Montgomery, who had kept his membership in the Madison Methodist Church, donated funds to help construct the new sanctuary as a memorial to his mother. Church members and interested citizens contributed approximately $3,000 for the building, which cost about $10,000. Mr. Montgomery, who would die ten years later in 1940, established a trust fund for the maintenance of the church. Once the new sanctuary was completed, the old building was moved a short distance to the west, where it is now used as the shop for Pickenpaugh Pottery. 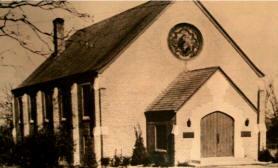 Full-time services at the Madison Methodist Church began on June 24, 1956. A new church parsonage was constructed in 1962 during the ministry of Harold Peden, and in 1968 an educational annex was completed under the leadership of the Reverend Harold Miller. This annex now houses the church nursery and preschool classrooms, whereas the parsonage is now used for children’s Sunday School rooms and the Educational Resource Center. When the debt on the parsonage and educational annex was retired in 1976, the church membership voted to initiate plans for a new sanctuary and additional educational space. The decision was made to continue the Lord’s Acre program that had been used to fund the construction of the parsonage and educational annex. The Lord’s Acre program was a tradition carried over from years ago when Mississippi was an agricultural state. Farmers each year would pledge to God the income from an acre of land, an animal, or a portion of their crop, with the offering to be brought to the church during the Thanksgiving season. By the time the contract was awarded in 1987 for the construction of the new sanctuary and educational building, the Lord’s Acre offerings had generated more than $750,000 in cash. As a result of the Lord’s Acre gifts and contributions generated by an accompanying capital fund drive, the debt for the $1.8 million sanctuary and fellowship hall/educational building was retired four years ahead of schedule. The new facilities, which were completed during the ministry of Kelly Pope, were consecrated on September 25, 1988, in a service led by Bishop Robert C. Morgan. 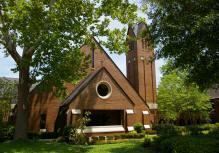 The church membership voted at a church conference on March 20, 1988, to change the name of the 1930 sanctuary to the Susan L. Montgomery Memorial Chapel and the name of the church to Madison United Methodist Church. In 1994 during the ministry of Jack King, the “Press Forward As One” capital campaign was initiated to provide funding for the Christian Life Center (CLC), a multi-purpose facility that is used for congregational fellowship dinners, athletic events, and group meetings, as well as health and fitness activities. The CLC, which was consecrated on June 8, 1997, was constructed during the pastorate of James M. Harrison at a cost of approximately $975,000. The expansion of the Madison United Methodist Church campus has also included the acquisition and renovation of the “Antique Shop” immediately to the west of the church parking lot. This building, which was purchased in 1999, now houses the church’s administrative and staff offices. The church membership voted on February 15, 2004, at a Church Charge Conference to purchase 2.515 acres from Mrs. Frances Rose Price Cox for approximately $849,000. This property is now known as the East Parking Lot. The East Parking Lot was graded, paved, striped, landscaped and lighted for an approximate cost of $250,000. It can accommodate approximately 200 vehicles. 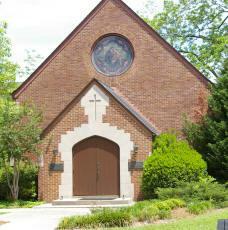 The Madison United Methodist Church complex is utilized seven days a week by church members and other individuals involved in Bible studies, Mother’s Morning Out, After School Care, Methodist United Women Circles, the Methodist United Men’s Club, Boy Scouts, Girl Scouts, Cub Scouts, Brownies, other children’s and youth activities, Wednesday night fellowship meals, VIP luncheon meetings, music ministries from preschool to adult, older adult programs, worship services, and Sunday School classes for preschoolers through high school seniors and adults. From the twenty-eight members reported in 1865, the Madison church has grown to a membership that now exceeds 1,900. The church’s mission outreach, which extends from Madison County to the Mississippi Gulf Coast to Mexico and Europe, demonstrates the church’s dedication to serve God and God’s people throughout the world.